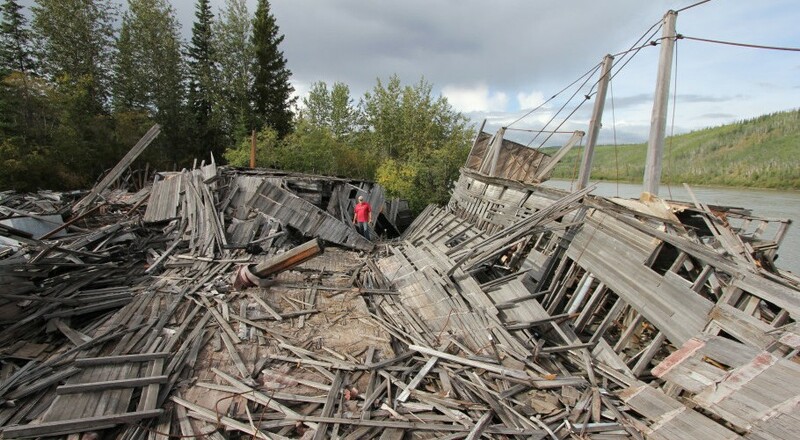 WHAT: 24 STEAMBOAT WRECKS | WHERE: YUKON, CANADA | EXCAVATION: 2005-PRESENT | DATE OF WRECK: A.D. LATE 19th-EARLY 20th C.
When the Gold Rush exploded in 1897 A.D., West Coast shipyards responded to the demand, and stern-wheelers were constructed in yards as far south as San Francisco and as far north as Dutch Harbour in the Aleutian Islands. In total, 266 stern- and side-wheeled steamboats operated on the Yukon River in Alaska and Canada. When the boom dissipated in 1900 A.D., many steamship companies either went bankrupt or were bought out by competitors, and surplus tonnage was abandoned. Often vessels were left derelict on shore along the banks of the river, where they had been winched out of the water in the fall to protect them from ice damage. As a result, the Yukon now contains one of the greatest intact collections of stern-wheel vessels known to exist, and many are in excellent condition. The Yukon River Project, initiated in 2005, aims to document the range of construction techniques used on these late 19th-century vessels. Using such techniques as total station recording, detailed hull survey, side-scan search, wood sampling, and drone aerial mapping, twenty-four wrecks and hulls have been catalogued to date. In the course of this work the team has undertaken complete assessments of six sites, and collected detailed information at other locations related to hull construction, chines, boiler, and tiller-and-rudder configuration. Considerable variation in construction is noted among the Yukon River vessels, and to date we have documented three of four general classes of hull design. These observations suggest that while certain common approaches were used in the construction of stern-wheelers on the West Coast at the end of the 19th century, significant variations were used in the hulls and particularly, in the components of the vessels of the Klondike Gold Rush. The idea of a few standard designs being used in the construction of majority of these vessels is not supported by the findings of our regional survey. In addition to illuminating purpose-built construction practices at the northwest at the turn of the century, this regional survey contributes to broader concepts of archaeological watercraft abandonment. To learn more, check out the NPS (Skagway Alaska) and the Government of Yukon (Dawson City Yukon) information panels featuring the project. Affleck, E.L. 2000. A Century of Paddlewheelers in the Pacific Northwest, the Yukon and Alaska. Vancouver: Alexander Nicolls. Davidge, D.A., J.C. Pollack, D. Reid, L. Thomas, T. Dowd and J.P. Delgado. 2010. “The Wreck of the A.J. Goddard.” In 2010 ACUA Underwater Archaeology Proceedings edited by C. Horrell and M. Damour, 183-191. Amelia Island, Florida. Easton, N.A. 1987. 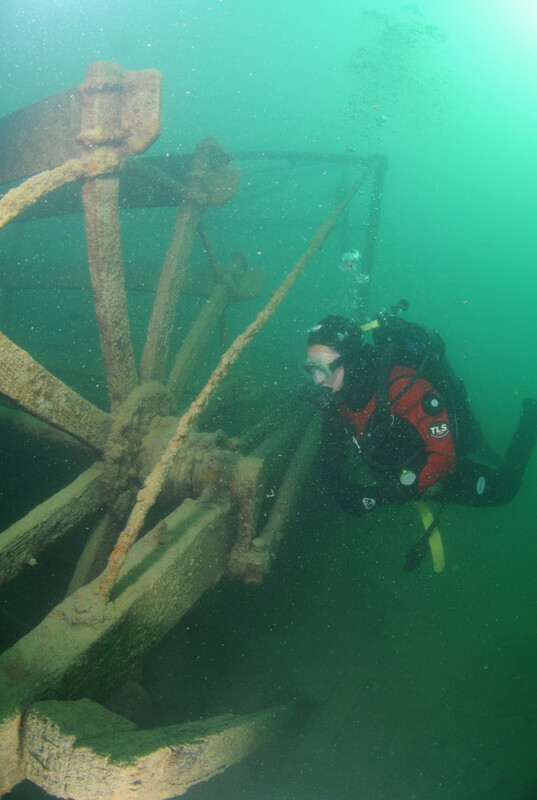 Yukon Underwater Diving Association Heritage Resources Inventory – Final Report. File report for the Heritage Branch. Whitehorse: Yukon Government. Pollack, J., S. Moffatt, R.Turner, R. Woodward and S. Adams. (In Press). “Hidden In Plain Sight: The Composite-Hulled Stern Wheel Steamboats of Western Canada” In 2014 ACUA Proceedings. Pollack, J., and R. Woodward. 2013. “Yukon Hulks and Ship Graveyards” in The Archaeology of Watercraft Abandonment edited by N. Richards and S. Seeb. New York: Springer Science+Business Media. Pollack, J., R. Woodward and D. Davidge. 2012. “A Catalogue of Historic Stern Wheel Steamboat Wrecks and Hulks in the Yukon.” File report to the Government of Yukon. College Station, Texas: Institute of Nautical Archaeology. Pollack, J., R. Woodward, C. Cartonelle and N. Kopp. 2011. “Mapping Hull Construction and Engineering on an Early 20th Century Yukon River Steamboat” in 2011 ACUA Underwater Archaeology Proceedings edited by C. Horrell and M. Damour, 94-102. Austin, Texas. Pollack, J., R. Woodward, L. Thomas, and P. Helland. 2010. “Mapping Hull Construction and Engineering on a Late 19th Century Yukon River Steamboat” in 2010 ACUA Underwater Archaeology Proceedings edited by C. Horrell and M. Damour, 173-182. Amelia Island, Florida. Pollack, J., R. Woodward, N. Easton, and C. Velazquez. 2009. “Ships of the Yukon Gold Rush” in 2009 ACUA Underwater Archaeology Proceedings edited by E. Laanela and J. Moore, 287-298. Toronto, Ontario. Thomas, L.H. 2012. “The A.J. Goddard: Reconstruction and Material Culture of a Klondike Gold Rush Sternwheeler.” Occasional Papers in Archaeology No. 16. Whitehorse: Government of Yukon, Department of Tourism and Culture. Thomas, L., D. Davidge, and J. Pollack. 2012. The Wreck of the A.J. Goddard: A Sternwheeler from the Days of the Klondike Gold Rush. Whitehorse: Government of Yukon, Department of Tourism and Culture. ABOVE: The sternwheel of Goddard, shown here with archaeologist Lindsey Thomas, churned for thousands of miles until overwhelmed by ice, wind and waves in October 1901 (Left Photo: INA). 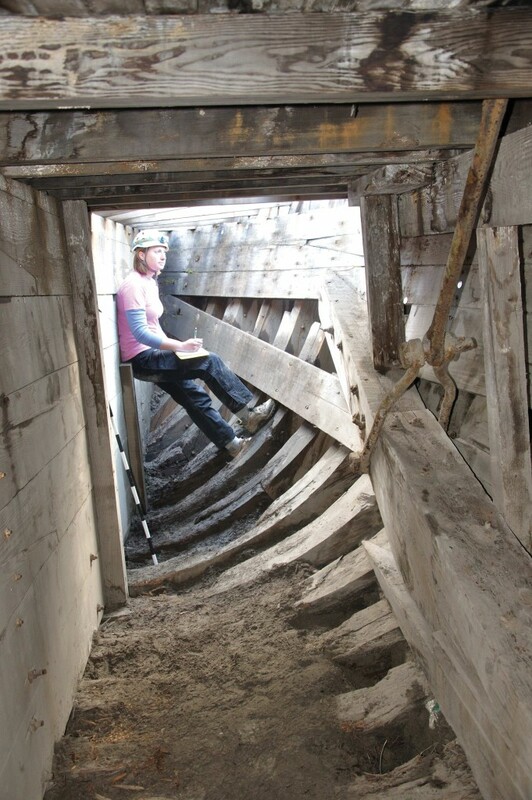 An archaeologist records the timbers of a steamboat (Right Photo: INA).